be located relative to your toe-line and stance. There are two things to consider when it comes to determining where you should position your ball in your stance. How Far from the Ball? It is generally recommended that the position of the ball should be under your eyes, or for your eyes to be just inside the ball. Your eyes should never be beyond the ball. The optimum ball position is typically around 8 to 9 inches from your toe-line, the same distance from the hollow in your neck to your eye-line. As the head of most putters are about 4 to 4½ inches long, the distance is about two putter heads. A common test is to take up your setup position and then drop a ball from your brow-line and note where it lands. Most golfers, because their putter is too long, have their eyes too far inside the ball. This makes aiming more difficult as their visual perspective is skewed. In other words they are seeing the ball at a diagonal rather than a vertical angle. Some teachers recommend that the putterface should contact the ball at the exact bottom of the arc. Their argument is that if the ball is contacted on the upstroke it will go a little to the left as the putterface is headed inside. There are others who advocate positioning the ball forward of the centre line of your body. They regard a putt as being similar to a drive in that you want to contact the ball slightly on the upstroke. The only place where it is not advisable to place the ball is back of your centre line as this will result in your putter reaching the ball in a descending arc before your putting stroke has bottomed out. 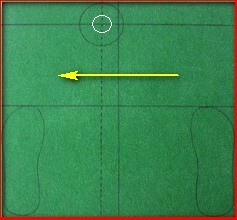 The recommended distance for positioning your ball forward of your centre line is one to two inches. This allows your dominant eye (mostly the right eye in the case of the right-handed golfer) to be positioned behind the back of the ball. For golfers who are left-eye dominant, but who putt right-handed, the ball can be positioned even more towards the left toe. Placing your putter up against the ball runs the risk that you will catch the grass with your putter as you start your backstroke. Hover your putter so that is not pressed down in the turf. Lift your putter on the start of your backstroke. Leave a small gap between your putterface and the ball. If your ball position is too far forward, the bottom edge of the putterface will catch the top quadrant of the ball (instead of the equator) resulting in an inconsistent roll. It is also likely that you will make a long backstroke, but stop your forward stroke abruptly.